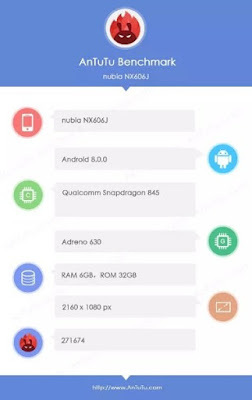 It is only few days back ZTE launched Z18 Mini in China.Now new leaks has been risen about Z18 the successor of Z17 which has been launched in 2017.The device is expected to come as premium segment smartphone. Accoeding to alleged Antuntu test,the device with Nubia NX606J is packed with Snapdragon 845 processor and Adreno 630 GPU with 6 GB RAM and 32 GB ROM.Its display is noted as 2160×1080 resolution and the device will bootup with Android 8 Oreo.However,the device is scored 271674 on Antuntu with aforementioned features. 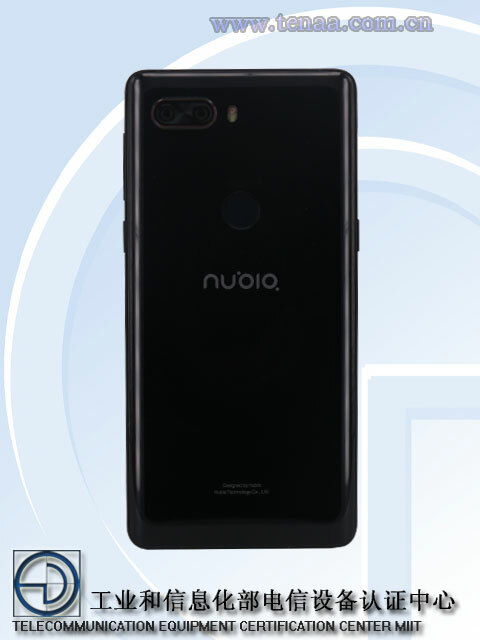 Looking to TENAA listing,it has 5.99 inch size in display while resolution remains same as Antuntu.The device will run on 2.6 GHz octa core core processor and it will have 6GB/64 GB and 8GB/128GB storage variants.The device will be powered by Android 8.0 Oreo.The handset will be equipped with 8MP+24MP dual shooter on rear and 8MP single lens on front.However the device is packed in 148.58mm×72.54×7.55 mm measurements and 172gm with 3350 mah battery. However,the device is expected to come with GOS,GLONASS,Bluetooth,USB TypeC,Wifi 802.11 a/b/g/n/ac,wifi hotspot as connectivities.